The story of Io is one of the oldest surviving tales of Greek mythology, for it predates the famous works of Homer, for the Greek writer would often make reference to it. In essence the story of Io deals once again with the love life of Zeus, for Io was one of the lovers of the supreme god, but the story of Io in Greek mythology is also a founding myth, dealing with events in Egypt and Greece. Io was a naiad, a freshwater nymph of Greek mythology; and Io was normally named as a daughter of the Potamoi Inachus, and Argia, an Oceanid. Inachus was a powerful water god, named by some as the first king of Argos, and so, Io was also given the title of princess of Argos by these same people. The daughter of Inachus was extremely beautiful, and it was therefore not surprising when the Naiad Io came to the attention of Zeus. Zeus would then seek to seduce Io. At this time, Zeus was married to Hera, and Hera was well aware of her husband’s infidelity, and so Zeus went to great lengths to hide his indiscretions. ​In the case of Io, Zeus covered the land of Argos in heavy cloud cover, masking events in the land of Inachus from eyes upon Mount Olympus. 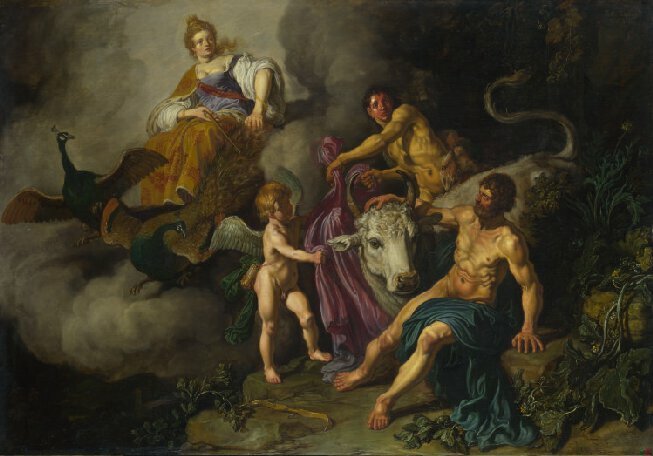 Feeling safe, Zeus successfully seduced Io, but Zeus’ feelings of safety was misguided, for the unusual cloud cover over Argos simply made Hera more curious, and so Hera also descended to Argos. When Zeus became aware of the approach of his wife, he acted quickly, and to avoid Hera catching him with Io, Zeus transformed the Naiad into a heifer. The transformation of Io might have stopped Hera being immediately angry, but the goddess herself was not fooled by Zeus’ metamorphosis of his lover. So, Hera asked Zeus to give her the beautiful heifer as a present. Zeus had no valid reason for refusing his wife’s request, and Io, as a heifer, now came into the possession of her lover’s wife. To prevent Zeus from returning to Io and transforming the Naiad back into female form, Hera would employ Argus Panoptes. Argus Panoptes was the hundred eyed giant of Greek mythology, and it was said that this giant was always watchful, for only two eyes ever slept at one time. Thus, when Zeus returned to Mount Olympus, Io was left tethered to a tree in Hera’s sacred olive grove in Argos. Zeus had not forgotten or abandoned Io though, and when Hera’s attention was focused elsewhere, Zeus dispatched his favourite immortal son to Argos. ​This favourite son was Hermes, the messenger god, but also the thief god, and Zeus charged Hermes with stealing away Io from Argus Panoptes. Now Hermes was an extremely skilful thief, but even Hermes could not steal away, unnoticed, Io from the ever watchful Argus Panoptes. Thus, Hermes was left with little choice but to kill the giant. Hermes would lull all the eyes of Argus Panoptes to sleep with beautiful music, before killing the giant, either with a stone, or by decapitating him. Io was now free, but Hermes had not the power to transform the Naiad back into female form. Hermes had also not been able to undertake his quest unnoticed, and Hera was soon aware that her watchman was dead. Hera would honour Argus Panoptes by placing his eyes upon the plumage of the peacock, and then the goddess planned her torment of Io. The punishment of Io would be simple, for Hera sent forth a gadfly to sting the hide of the heifer, causing Io continual pain. Thus Io would start to wander the ancient world, pursued by the gadfly. Io would depart from Argos making for Epirus and then Dodona, before taking time to rest at the coastline of a sea, before swimming across it; that sea was said to have been named the Ionian Sea after the Naiad. Io would also give her name to the Bosporus, for that name means “ox passage”, for again Io swan across the Straits. The most significant part of the wanderings of Io though, occurred in the Caucasus Mountains, for it was here that Io obtained hope. 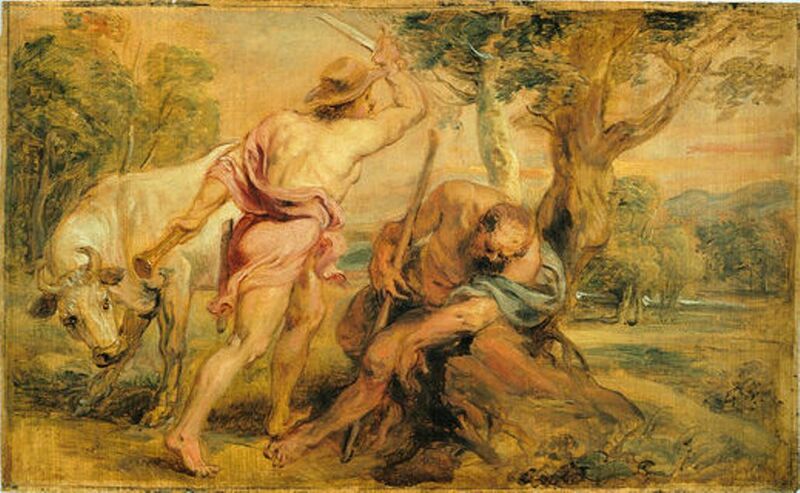 Io would come across Prometheus in the Caucasus’s, for at the time the Titan was chained to a mountain in punishment. Prometheus would aide Io, for the Titan had the gift of foresight, and so advised the Naiad about the route she should take to find salvation. At the same time Prometheus also comforted Io by proclaiming that her descendants would be numerous and include the greatest of Greeks. Following the words of Prometheus, Io now knew that she must travel to Egypt, and with renewed hope, Io began her travels once again. The disappearance of Io had of course not gone unnoticed by her father, Inachus, and the Potamoi went out his own envoys to find any trace of his lost daughter. These two envoys were Cyrnus and Lyrcus, and although both covered a great deal of distance, both came to realise that their quest was impossible. Eventually both ended up in Caria, and whilst Lyrcus married a daughter of King Caunus, Cyrnus established a new town which was named after him. To travel from the Caucasus Mountains to Egypt was no easy thing in antiquity, and it was a journey made more difficult if you were a heifer. Nevertheless, Io did make it to Egypt, and there found some respite by the banks of the River Nile. Zeus then met Io by the Nile, and touching the heifer with his hand, Zeus transformed Io back once again into her Naiad form. Io was then able to give birth to the child that she had been carrying since her original liaison with Zeus. This child was a boy, who would be named Epaphos. Epaphos would be regarded as the sacred bull Apis from Egyptian mythology, whilst Io was considered to be Isis. Some writers tell of how Hera had not finished tormenting Io though, and when the goddess found out that a son of Zeus had been born, sent forth the Curetes (or Telechines) to kidnap the new-born baby. When Zeus discovered the abduction, the god sent down his lightning bolts, killing those who had abducted his son, but Io was forced to travel once again in search of her lost son. This time the wanderings of Io were shorter for she had only to travel as far as Byblos (Lebanon), and there she found Epaphos safe in the royal court of King Malcander. Less often spoken of was Ceroessa, a daughter born to Io by Zeus. Some tell of Ceroessa being born in Egypt like Epaphus, but others tell of Ceroessa’s birth during the wanderings of Io. If born during the travels of Io, the place of Ceroessa’s birth was said to be the place where Byzantium would stand, for Ceroessa, by Poseidon, was mother to Byzas, the founder of Byzantium. In Egypt, Io would marry Telegonus, an Egyptian king, and subsequently Epaphus succeeded his stepfather, and built a new city in the form of Memphis; and for generations, the kings of Egypt were the descendants of Io. Epaphus, and thus Io, was also said to be the ancestor of all Ethiopians and all Libyans. Io was considered to be the same goddess as Isis in Egypt, and thus Io also had a god as partner, this partner being Osiris. By Osiris, Io would become mother to Harpocrates (Horus the Child); Harpocrates was the Greek god of Silence and Secrets. The prophecy of Prometheus would also come true, for in later generations the descendants of Io would return to Greece, and Cadmus would found the city state of Thebes and Danaus founded Argos. Thus Io, alongside Atlas and Deucalion, was considered one of the three main ancestors of the Greek peoples.